This is the AI I wrote for BOX. ASM file contains standalone AI, ips contains enemy, gfx and a room with BOX set up (the room from the video). Its AI is still lacking some attack patterns and a proper projectile, you'll have to be smart and code them yourself if you want a better fight. It's more for educational purposes rather than being used in a actual hack. You can add three palette loops @ the beginning of the MAIN AI & do away with the fx2 palette code in bank $8F. Just add a check for some hp values, it doesn't work in the INIT AI. There's a very small, annoying gfx bug involving the left leg when opening for bombs. Changing STR_GREEN_BOMB_C to six animation frames is a quick fix. As for projectiles, I can't get it to show non-glitched gfx when they hit a surface. I made my own, they're cheap & clear up before hitting the ground. 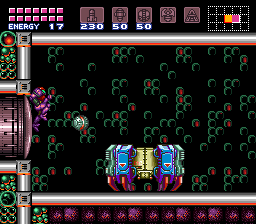 Praise to Black_Falcon for the new Super Metroid boss.